The home goods retailer faces economic headwinds, but it could still turn it to its advantage. It's not beyond belief that home goods retailer Bed Bath & Beyond can turn around once again and shoot higher. The bounce Bed Bath & Beyond's (NASDAQ:BBBY) stock enjoyed following the revelation private equity firm Leonard Green & Partners had established a near-1 million share stake in the company over the past year has evaporated. The stock continues to slide and it now sits more than 12% below the record highs it hit last December. It has hit a number of headwinds since then, including slowing sales growth, but here are top three reasons why the home goods retailer could soon resume its winning ways. 1. The economy continues to recover. The long, slow slog out of the Great Recession continues for the U.S. economy, as new housing starts remain depressed (even if they're higher than the depths to which it sunk back then) and employment is uneven, with the non-participation labor rate at levels last seen in the late-1970's. But the economy is expected to grow 3% this year and next, the best two-year performance in a decade, and consumer confidence is edging higher. There's little doubt the situation remains dicey, but if consumer spending can shake off its doubts that could have a beneficial impact on retailers like Bed Bath & Beyond. The home goods retailer still prospered during the recession, and even if the situation is only a modestly improved one today, it's still so much better than where it was. Headwinds are ever-present, as the retailer's sluggish sales growth showed last quarter, but further strength can push Bed Bath & beyond higher. 2. Consumers start spending more. The drop in gas prices that we enjoyed earlier this year didn't benefit retailers as much as expected as consumers either used the extra cash to save or paid for groceries, which are still under inflationary pressures. But wages and benefits have finally started rising after having stalled for a long period of time. The Labor Dept. said wages and salaries rose 2.6% in the first quarter while benefits were up 2.8%. It's the fourth consecutive quarter they've shown a strong performance. Considering consumer spending accounts for more than two-thirds of U.S. economic activity, even if we haven't opened our purses more than a just crack yet, it points to better conditions ahead. 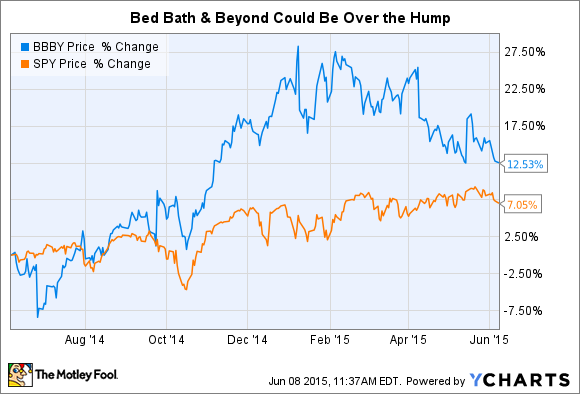 That could be a well-timed event as Bed Bath & Beyond's new omnichannel efforts are beginning to pay off. The reported comparable sales completed through its customer-facing websites and mobile applications grew more than 40% last year, compared to in-store comps, which were up only slightly more than 1%. Since Leonard Green's investment came to light, speculation is growing it could be a candidate for a buyout, with analysts pointing to its attractive valuation, low debt levels, large cash position, and the P/E firm's own penchant for not being a Warren Buffett-type buy-and-hold investor. It buys companies that it can leverage into something more. Earlier this year Leonard Green agreed to take gym operator Life Time Fitness private in a $2.8 billion LBO. Previously it acquired BJ's Wholesale Club, Petco, and Sport's Authority. At just 0.6% of Bed Bath & Beyond's total outstanding shares, Leonard Green's position remains a small one, but size isn't necessarily crucial here. It could still be used to attract other investors as well as serve as a springboard to bring management to the negotiating table. With the home good retailer's conservative management team and firm financial footing, it could be an attractive candidate itself. There remain a lot of hurdles for Bed Bath & Beyond to get over before it's able to resume the strong growth trajectory it enjoyed in 2014. That this year is off to a very sluggish start suggests it won't be easy for the retailer to regain that momentum, but if just a few pieces pall into place, investors may be surprised at how fast its stock takes off again.